Silver stitch on dark, grayish blue. Tattered cloth waves in the cold winds, slowly filling the frame to reveal the sigil of the House of Wolves. Fiercest of all the houses, but lost, fallen, and scattered to the stars like the rest. Woven fiber from above. Old and worn but intricate and trimmed with gold. Shimmering dust catches the eye as the camera moves slowly forward. By dark cerulean blood and broken glass, a grizzly scene is revealed. Past the curled fingers and over the chest of an Awoken Queens guard. More bodies lay, victims of a violent struggle, some punctuated by spear. The cloak turns with its wearer, revealing matted fur coated with frost. The Fallen Captain turns. Drifts of snow and dead grass now revealed. It continues on, assured for the moment their path lies masked. Other of the pack stalk ahead, distant. 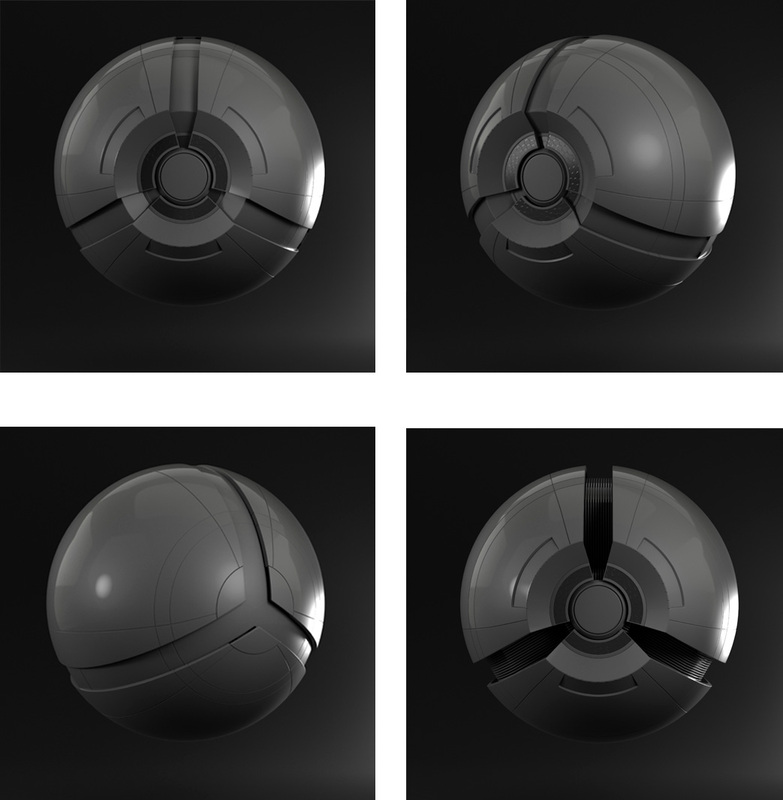 A Servitor keeps pace, dark ancient metal seemingly weightless, drifting forward. Wind. Snow. The Queen stands still, only her hair slowly shifting. A shattered window frames her, before the dark swirling clouds of The Reef. 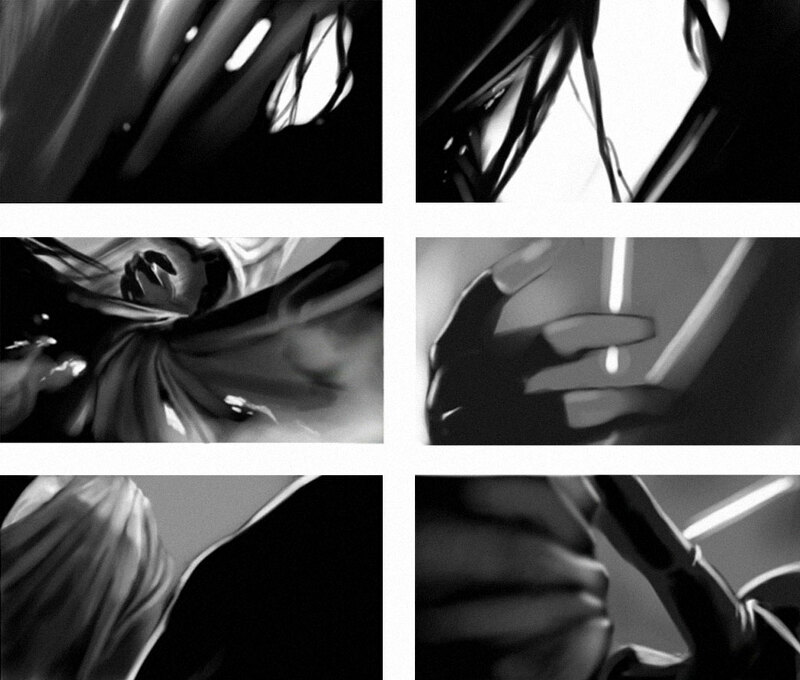 For the meat of the sequence, I wanted to experiment with two long shots to communicate the main body of the story and only have five shots total for the duration of the cinematic. For the storyboarding and concept process, I collaborated with artist Daniel Thron to sketch out each shot and rough out some early supporting concept art. 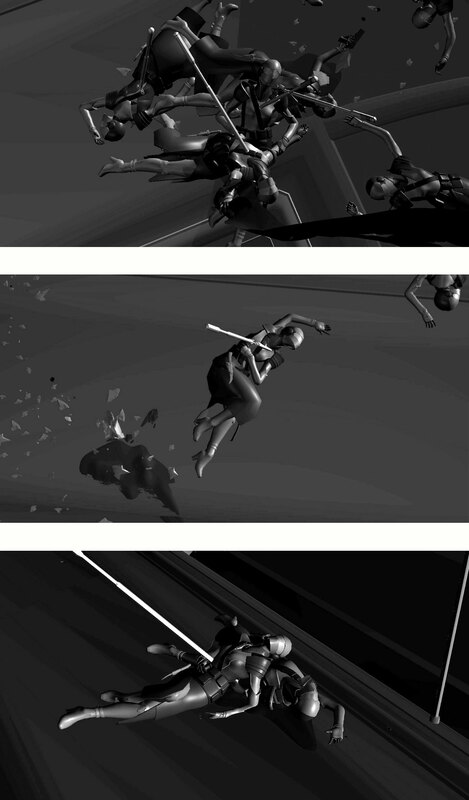 The sequence portrays the betrayal of the Awoken Queen by The Fallen, who are depicted escaping in a fierce blizzard moments after slaughtering the Queens Guard’s in the throne room. Happening simultaneously, the Queen arrives in her throne room moments after and discovers the aftermath of the violence. There was a lot of experimentation on how to enter and reveal the throne room, but we decided to tease out the shot forcing the viewer to discover elements slowly and piece together the scene opposed to showing it all at once. 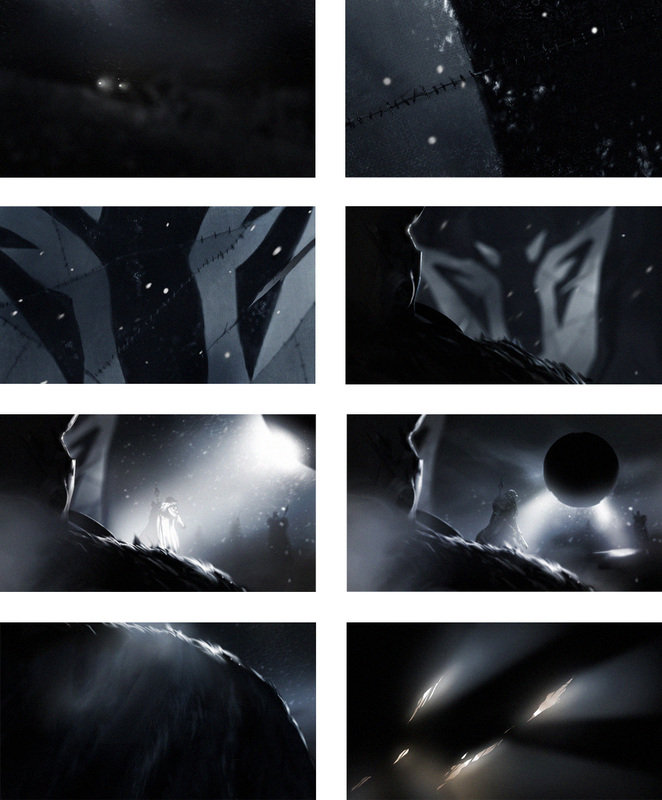 The transition into the throne room was something that I was not happy with in earlier renditions of the storyboard. Originally it was a simple reveal past a curtain and we would have entered on ground level which I felt was not that interesting. We decided to revisit this and corkscrew down a curtain into the scene passing by two tangled dead Queens Guard’s. 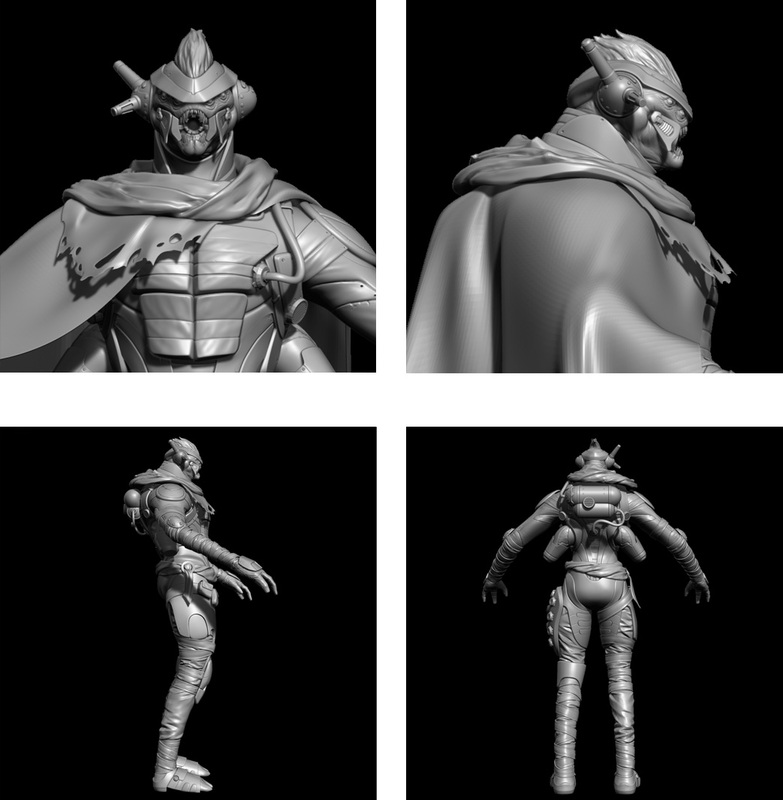 This ultimately provided an opportunity to show off the details of the characters and burning fabric. Camera and staging were then figured out with Marc Perrera in order to previz the entire shot. 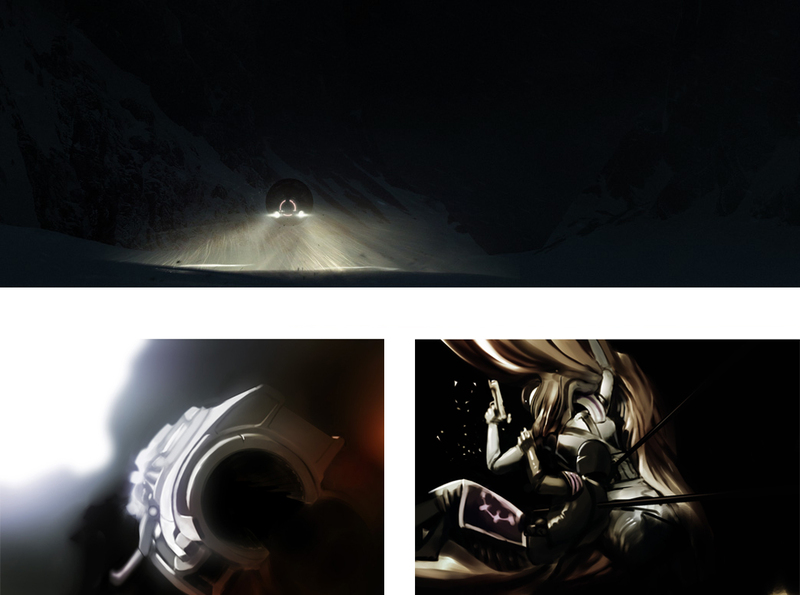 Some early initial concept art to illustrate environments and scene lighting. 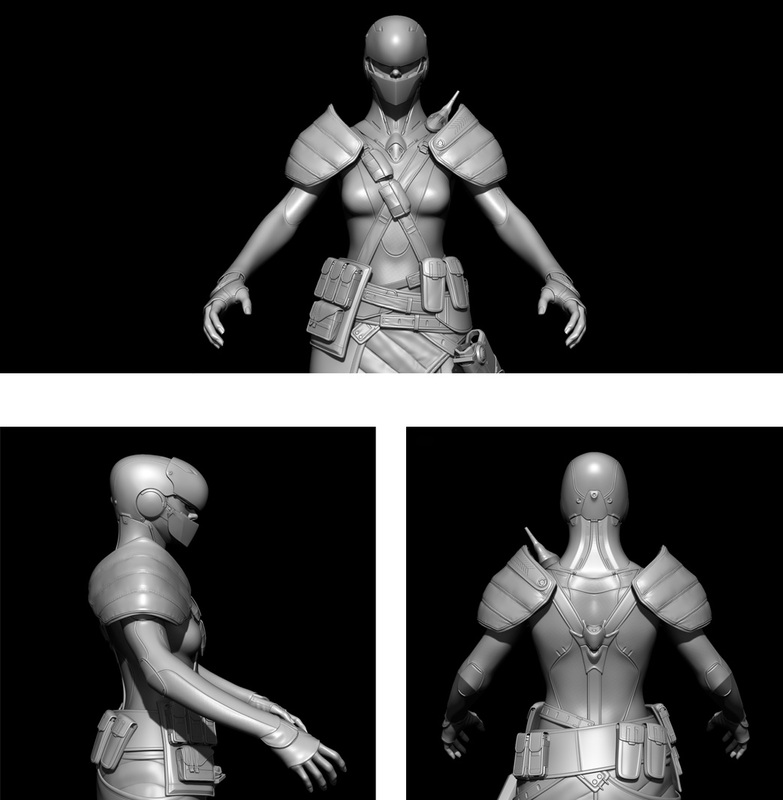 Besides the environments and weapons, the modeling team was also tasked with modeling the character assets. 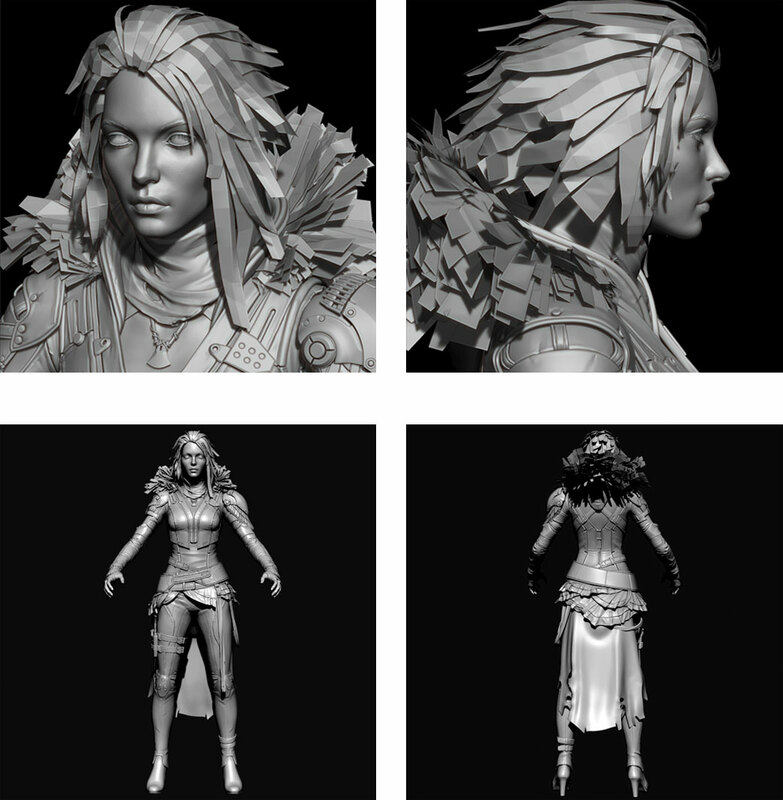 Starting with a low-poly, in game model, facial features and clothing were re-sculpted to the detail and resolution you see in the final sequence. 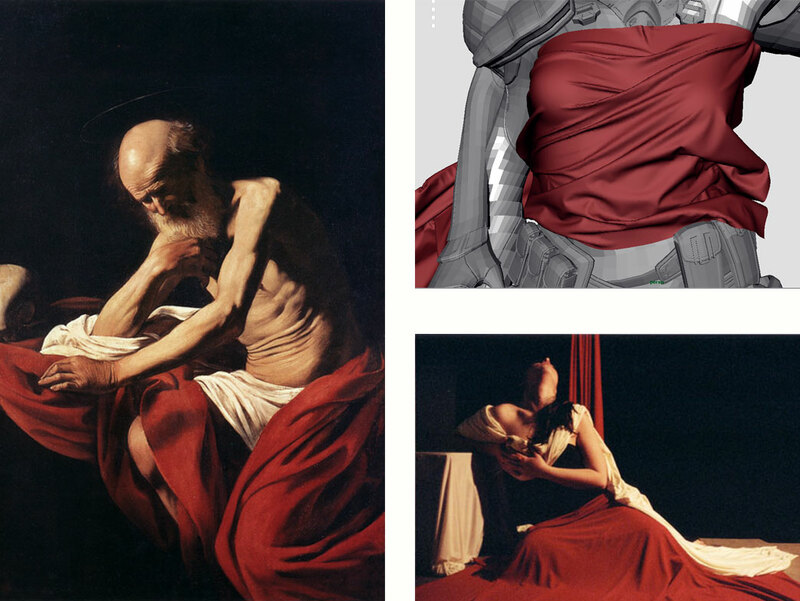 For the lighting, cloth detailing and form, I referenced the paintings of Caravaggio and Gerard Van Honthorst. The primary reasoning for this was the fact that I was drawn to the warmth and minimal use of light sources that created the focal points in the scene. Everything else was left to fall into darkness with only slight details visible. 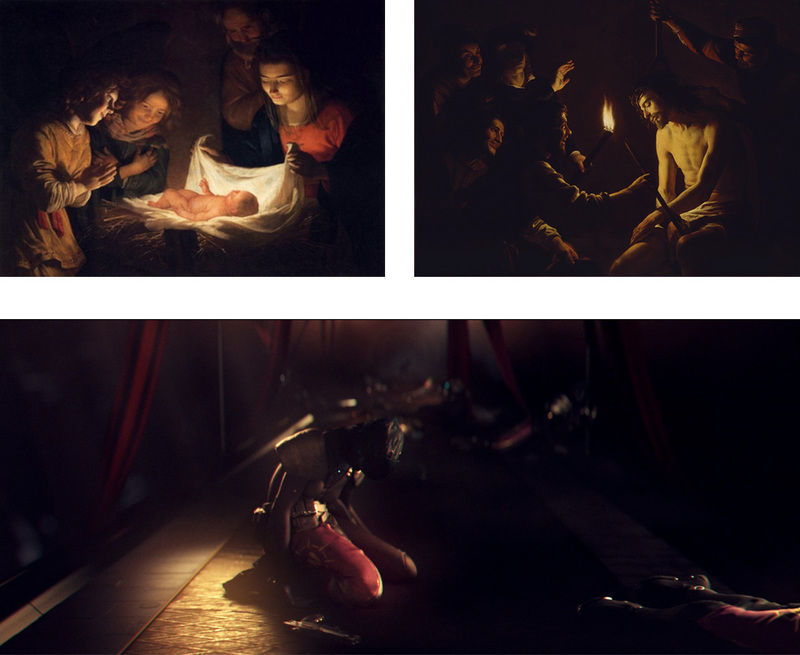 The single sources of light in the Gerard Van Honthorst reference images below only illuminate the key subject/s. 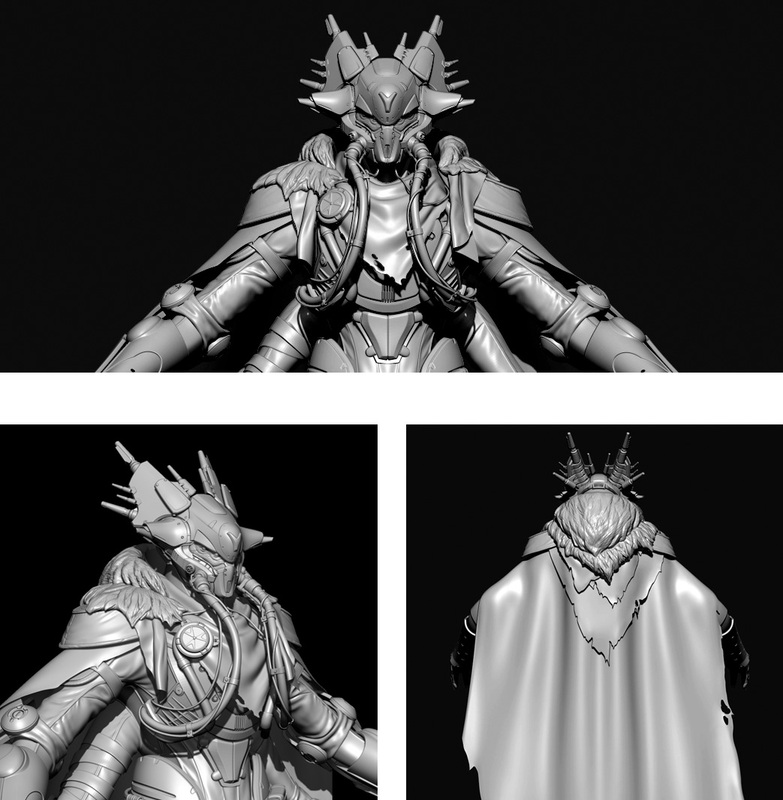 Early texture tests of the Queens Guard’s. 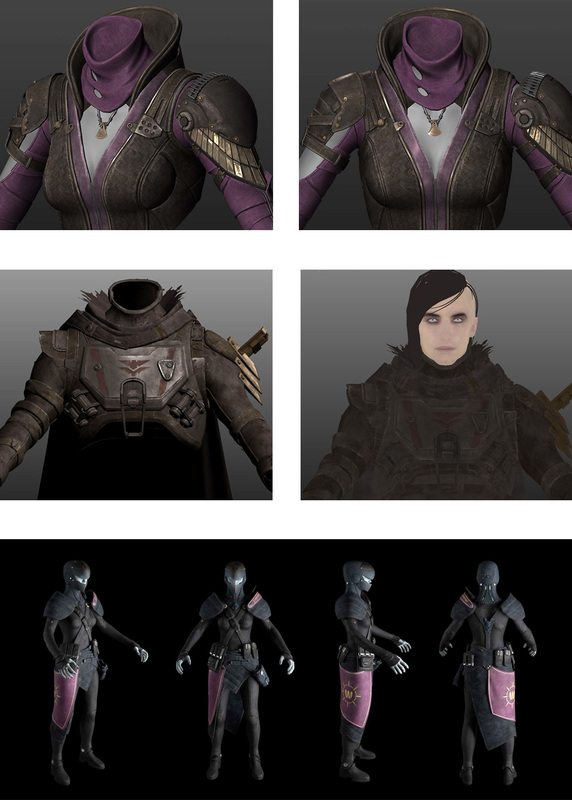 Clothing textures of The Crow and The Queens Guard’s. The original concept involved having the Queens guard’s impaled by spears and featured pools of blood and blood stained clothing. 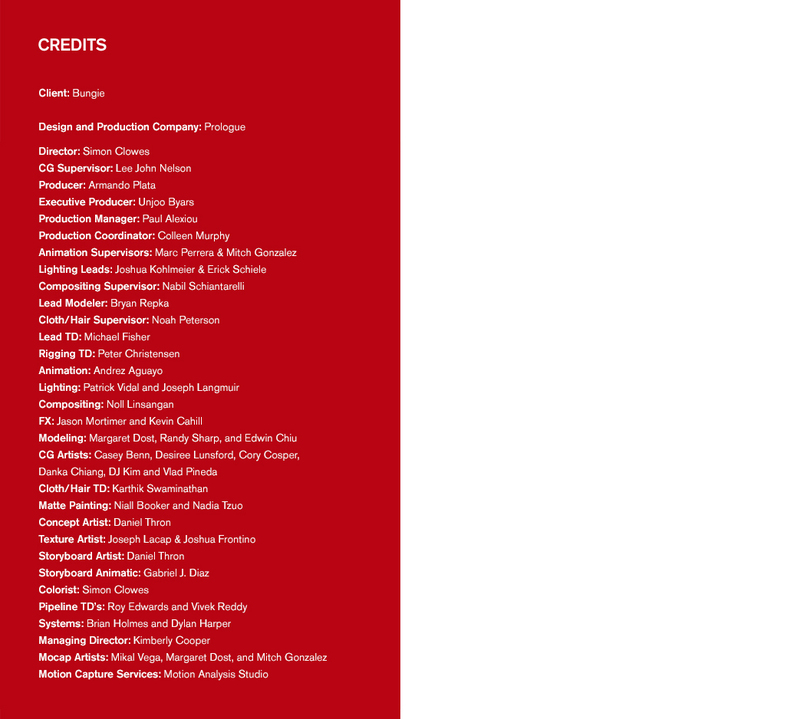 These elements were later removed due to concerns with the rating of the game. 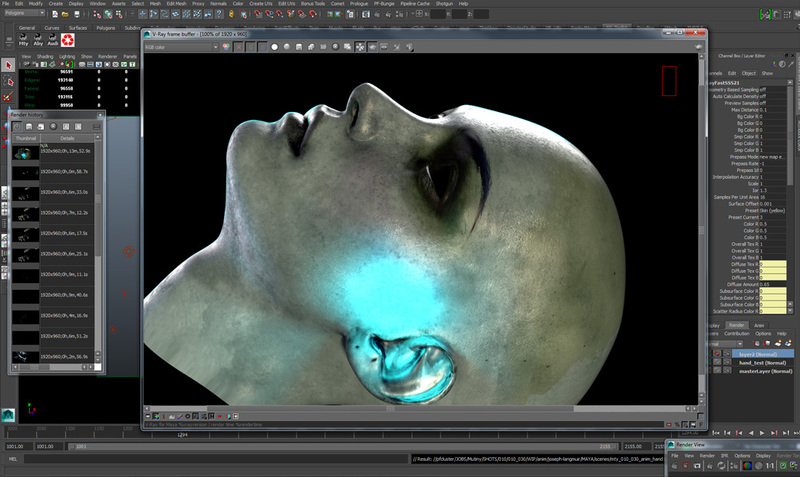 The final sequence was rendered out of V-Ray with additional help from Arnold for some of the volumetric lighting from the Servitor.